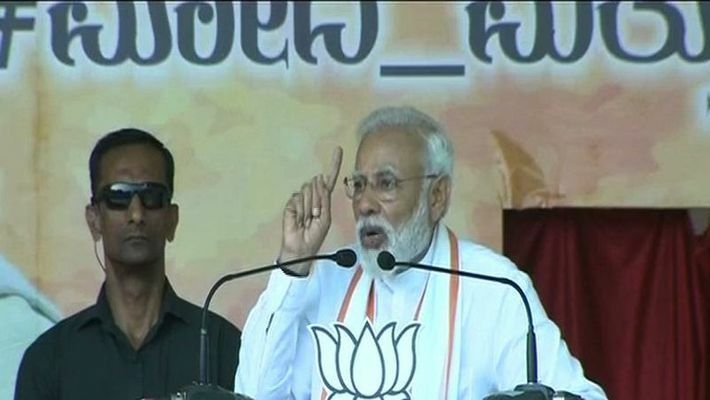 Bengaluru: With less than a week left for Bengaluru to vote for Lok Sabha election, Prime Minister Narendra Modi gave a clarion call to defeat the Congress and help him secure the country once more. Addressing a massive gathering at the Palace Grounds, Modi touched upon several aspects - from security to inflation to red beacons on cars to war memorials - and ridiculed the Congress for its alleged corruption. Specifically hitting out at AICC chief Rahul Gandhi, Modi said he is out on bail (National Herald case) and wondered what he had to offer for the country. If at all he is voted back to power, Modi added that the next generation of Indian citizens would be under risk as Congress has absolutely no vision. With the middle-class in mind, Modi said the Congress was targeting it in order to benefit someone else. But he said, as long as Modi is in power, he would not leave the middle-class burdened. Next in the receiving line was HD Kumaraswamy, the state chief minister. Adding that he was more concerned about his son winning Mandya, Modi said he is running a 20% government. Lastly, Modi did not miss out on an opportunity to answer those who allege he was misusing the I-T department. To drive home his point, he said he was hounded by the police when he was the chief minister of Gujarat for nine hours and he did not grumble about it. But now, when such departments focus their lens on several other leaders from other parties, they start crying foul. The Prime Minister signed off by reminding them that he was done with the 'red beacon' culture so that everyone remains grounded.